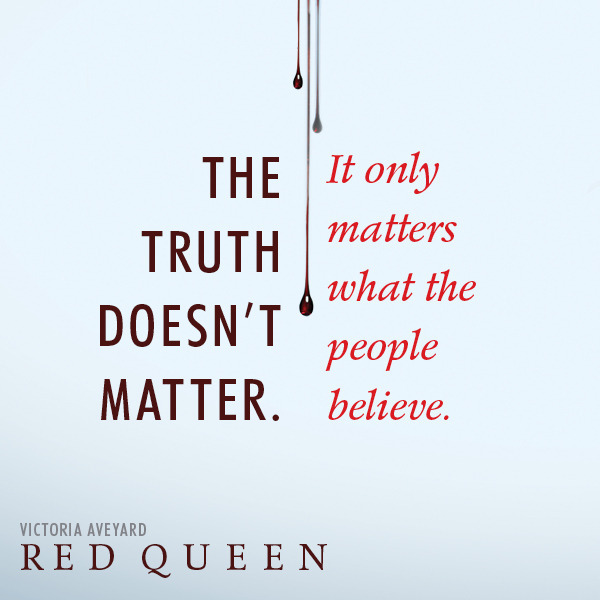 INTERVIEW: Victoria Aveyard, author of ‘Red Queen’ chats about Mare, twisty plots & ‘Glass Sword’ – MP! Red Queen was a massive success – was there ever a point during the writing process when you had doubts about it? Yeah, pretty much the entire time. I had no idea what I was doing. There were a lot of times when I didn’t want to finish the book and I thought it was garbage, and luckily, one of my friends was reading it as I was writing it, and so was my dad, and every time I would slow down and get down on myself, they’d be like, “Okay, that’s fine, you can just stop writing, but can you tell us what happens, because we want to know.” So I said, “Okay, fine, I’ll write it, I’ll finish the book!” So, that’s part of the reason why the book ever saw the light of day, because my dad and my friend were bothering me about it. And yet, so many people have fallen in love with the series – and a lot of them for very different reasons: the X-men style superpowers, the action, romance, intrigue…but what would you say is the most significant part of this series? I would definitely say the main character, Mare. I love her, I love her personality, and her selfish survival instinct. People always ask me if I’m Team Cal or Team Maven, and I’m like, I’m Team Mare, man, and that what the books about and that’s who matters. And character of Mare is so important, because she’s so nuanced. She’s the protagonist but is very much still making mistakes and having these real ethical issues to deal with. Whenever you were writing Mare and your characters this way because you were trying to blur the lines of good and bad in an already twisty plot, or do you just think this is how characters should be – with complications, not wholly good or bad? Yeah, I think it’s a bit of both. I personally enjoy books where there’s a lot of blurring of the lines and grey morality – the ‘Game of Thrones’ books are some of my favourites. I also think to make realistic and well drawn characters, you have to create people who are nuanced, who have dichotomies and different dynamics within themselves, because that is how real people are, so I think the more complicated the peoples allegiances are the more complicated they seem, so a character like Mason is extremely complex but he is also really, really fun to write and that makes me a better writer because he is so hard to nail down. Obviously Mare’s love life is really tricky. In Book 1 we had Kilorn who was at home. Cal who was betrothed to someone else and Maven as her fiancé and this resulted in very different romantic interests and we really weren’t sure which way it was going to go. Was this another way of you twisting the plot or was there a specific reason for you twisting the plot to include three different love interests in this? They all kind of organically came out of the story. I knew I always wanted to have the friend at home, Cal, and Maven…And Maven I always knew what was going on with him from the very beginning. So I was really excited to present the character who a lot of people usually think “oh he’s the younger brother who is always overlooked, maybe he’s going to come out as the front runner because he’s sweet and kind and then I just thought “No, no, he’s not! (laughs) That was my favourite scene to write and was always the one that I kind off motivated me to get though the rest of the book. I have to write chronically so the whole time I was thinking I can’t wait to write this scene. Do you have a favourite character? Is Maven your favourite character to write? Yes, beside Mare, of course. I was in her head of so long, if I hated her I would not be able to write the book but Maven was definitely one of my favourites to write. Obviously Mar has a lot of responsibility even though she is only 17. Is there a reason you wrote her this young instead of in her early twenties, middle twenties? It was really the age range that spoke to me. I started writing this book when I was 21 years old. It was very easy for me to tap into that mindset as it was still so close to me and I think it sort of upped the stakes a little bit too when you have people of 17, 18, 19, and dealing with worldly repercussions of their actions and I had just graduated college and I felt trapped by my collegium and I magnified this on to some one else who felt trapped by their circumstance. You’ve already mentioned how you really like writing Maven’s character, but what is the most important thing for you in these books: plot or character? It’s funny because I would be the first one to say that I have a real problem writing character. I am always a world builder and a plotter. Back when I was in college studying creative writing that is something my professors always got on me for. “You have a really good world and a plot but the characters aren’t really there”. So I am really happy that people are responding to these characters and asking what’s more important to me because usually they all say I like the world, I like building the world but people think I like the characters more, so it’s very flattering. Who would you say are your main inspirations for that world building? My favourite, favourite authors are J R R Tolkien and J K Rowling and George R Martin who are real heavy weights in terms of building worlds and putting stories in them that really just feel larger than life. In terms of ‘Red Queen’ I think a lot of my inspiration came from the ‘Song of Ice and Fire’ books in they way that they twist fantasy trope and thy way they make you think it’s going one way and then go in a completely different direction I tried to do at least 1% of that for the fairytale fantasies and young adult books. Currently you are working on Book 3, is that right? Yes I am writing Book 3 right now. 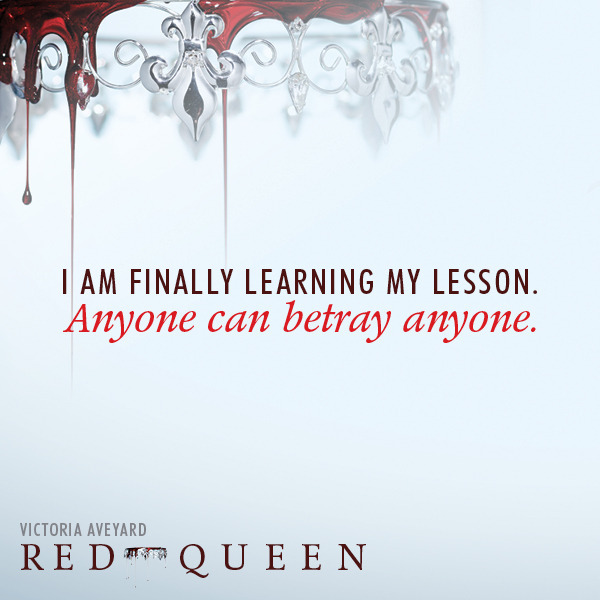 Is this going to be the finale of the Red Queen series? It’s actually not. When I was outlining the third book I discovered that I was not going to get to the ending that I had in my head. I had known the very tale end in the second book and I realised that when I was outlining I was not going to get to that place in the third book so I have to do a fourth. Do you enjoy freaking your readers out? I love it. I think it’s my way of putting my own pain of other cliff hangers from other books and movies that I’ve experienced, it’s my way of doing that to someone else. Do you enjoy that plot aspect of it rather than, say, a normal type of plot where things seem to be going it in the right direction. Is that your forte, this twisty-ness? So far it seems like it. This is only my first set of books so who knows. I could be writing really lovely romance novels by the end of my career but for now that’s what I really like to do. Between screen writing and novel writing do you see a lot of difference in how this works? Do you prefer novel writing? I usually say the one I prefer is the one I’m not working on at that particular time. So as I’m writing a novel right now and that’s my focus and I’ll be like “Man I wish I was writing a screen play” but if I’m writing a screen play I always wish I was writing a novel. They both have their pros and cons but they are also very similar in terms of how you structure a story, at least the way I do. I’m always going to structure my book the way I was taught to structure a screen plays and films which is 8 sequences, 3 acts. So if someone who knows that structure very well will read one of my books you will see the scenes very, very carefully, they’re right there. It’s kind of funny when people from my old college class will read the books and say “oh here’s where act 2 ends, I see that exactly”. You said earlier you are a fan of Games of Thrones, that’s sort of obvious in how ruthless you can be with your characters. There are people from Book 1 that I thought were really going to survive and they just didn’t. Do you think it’s important to be subjective with your characters like that, not just keeping them around because you love them too much? Yeah I think so. Luckily for me a lot of people say “oh I’ve cried already for…” but for me I haven’t reached that emotional level yet. Maybe it means I’m not connected but I don’t think there are any characters who if they were gone I would miss them too, too much. Well that’s not entirely true there is a character from the second book who I now miss in the third book. I wish that person was around. Are there more characters then that will be introduced in Book 3? In Book 3 yes. Book 2 expanded a lot of different characters one side of the Red and Silver divide and Book 3 is going to expand more characters on the silver side, just by virtue of the way the second book ends. We have to go to a whole new sphere of influence. On a really basic level where did the inspiration for that Red/Silver divide come from? The first ‘Red Queen’ idea I had I got from an image of a girl in an arena, kind of like Gladiator, who was about to be executed and instead of being executed she killed her execution with lightning, and I thought to myself, OK I would read that book, I would watch that movie, what’s this story about. I liked it and I sort of started building out of that and one of the scenes that really always struck me about stories like ‘X Men’ or even ‘Harry Potter’ is that the superpower people for whatever reason are on the fringe or are hidden and I would always think there is no way that that is actually how that would play out. You know a hundred years into a world with super humans they would be running the world. So I kind of wanted to play with that idea and then the red and silver thing I just thought it was a really cool visual. I’m more of a visual writer so I thought, OK, these two guys fighting each other in an arena it looks like normal humans and then one of them hits the other one and his blood is silver. That’s super cool. People with mercury for blood that’s awesome. A lot of my writing is “this sounds cool I’ll throw it in”. With it being so visual, why did you choose to make it a novel then instead of a film? Just by virtue of how limited screen plays can be when you are building huge worlds like this, especially if you are a new writer. Someone like Quentin Tarantino would get a little more leeway and be able to write for hundreds of pages that something like this requires but you know I was a 21 year old nobody, so even if I did write this as a screen play, I highly, highly doubt anyone would have given this a second look. I hadn’t always wanted to write a novel, I just didn’t think I could but by the end of college I had written several screen plays so thought OK, maybe I finally have the skill level where I can write the end of a story and I started brainstorming on this one and my management team told me to go for it, so I did and it was obviously the right decision. This story definitely requires the basis of a book to get it off the ground , to explain what’s going on. Yes, there is a lot of detail in it. Now that the film rights have been sold that must be really, really exciting. Are you looking forward to seeing what your story will look like on screen? Yeah, I’m really looking forward to that – knock on wood! Universal have the option on the film so what that means is we are still very early on in the process. A lot of the people believe that when the rights have been sold and the options are sold that means the movie is already in the works but Hollywood likes to see how things play out and they are little bit slower than publishing which is odd because publishing feels so very long but publishing is at least a very steady, know what your schedule is where film can be wait, wait, wait, and then oh my we are making a movie hurry up. I’m kind off learning that side of the ropes and just going with the flow and hoping that the best of the story happens. We asked our twitter followers earlier if they would like to ask you any questions, so we have a few from them if you would like to answer them as well. Yeah okay! Do you have a favourite YA book? I guess, I describe ‘Harry Potter’, the later books for young adults, definitely within the category range, so yes ‘Harry Potter’. ‘Ella Enchanted’ would be another. I read that when I was 7 or 8. I just loved it. Which Hogwarts House would you be in? I’m a Slytherin, I know that. ‘Divergent’ faction? Ahhh I don’t know if I’m talented enough to be in it. I would like to say Erudite but I don’t know think I’m smart enough. I do not fit into Abnegation at all. I would say Candor but I can sometimes be a little shady but maybe not. I don’t think I’m Divergent. I think I’m factionless. Do you have any tips for plotting books? I hate outlining but I force myself to do it because it pays off in the end. So I usually do a 5 or 6 page outline where I work out what’s going to happen and I try and structure it into 2 or 3 different acts so I know what the basic bones of the story is but I also leave a lot of room so that I don’t lose the magic of writing it and discovering the story as I’m going along. Do you have any plans for a UK tour? I would love to visit again I was actually in Scotland in the summer and for New Years. Edinburgh, I usually go there. It was fantastic. I’d never been for New Years. My Mom is Scottish, so we go a lot, but never for New Years and it was really, really amazing – the fireworks and the street festivals and the parties. We here at MaximumPop! would like to say a big thank you to Victoria for taking the time to speak with us – and make us all kinds of worries for what’s going to happen in her next books. Next article 10 pieces you need from Kendall and Kylie’s clothing range… And yes they are absolutely gawjus! Oh, have Chicken House got some awesome in store for you at YALC this weekend! 10 pieces you need from Kendall and Kylie’s clothing range… And yes they are absolutely gawjus!